LOCATION: Full sun to partial shade. Morning sun and afternoon shade is the ideal location. PLANTING: Transplants can be set out anytime other than winter. Start seed in late winter inside and do cuttings anytime during the growing season. BLOOM/FRUIT: White flowers with yellow centers from summer into fall. GROWTH HABITS/CULTURE: Erect, compact growth. White and yellow forms available. Soft, light green serrated leaves. Easy to grow in any well drained soil. Will self-sow easily. 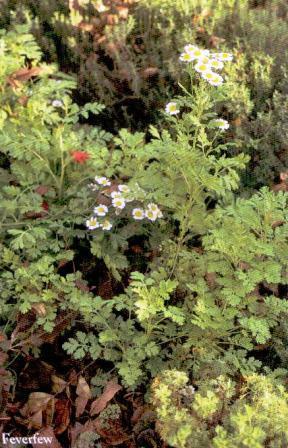 Feverfew needs moist soil for best results. PROBLEMS: Can scorch in full sun. Best to grow in morning sun and afternoon shade. HARVEST/STORAGE: Cut, dry and store leaves and flowers. Best to harvest the leaves before the flowers form. Pick flowers just before they open and hand upside down. MEDICINAL USES: Tea from flowers for migraine headaches and muscular tension. Leaves may also be used to help migraine headaches in tea. This tea is also said to help with menstrual problems. It should be avoided if skin photosensitivity occurs. LANDSCAPE USES: Good in the perennial garden and in containers. OTHER USES: Dry flowers for potpourri, dried arrangements or wreaths. INSIGHT: May be listed in catalogs as Matricaria eximia. Feverfew should be avoided by pregnant and lactating women. It is said that bees dislike the smell of feverfew.